There are many unanswered questions about the universe that keep scientists awake at night, theories like the birth, evolution, symmetries and consistency of the universe remain a puzzle for physicists. Recently, a team of researchers at the US’ Fermi National Accelerator Laboratory has started an innovative experiment that will collect data to answer some of the weirdest unanswered questions of the universe — including whether we live in a 2-D hologram. We want to find out whether space-time is a quantum system just like matter is. If we see something, it will completely change ideas about space we’ve used for thousands of years. The holographic principle states that although we perceive ourselves as living in a three-dimensional world, with time as the fourth dimension, the reality may be very different, an illusion. Some scientists believe it possible that the space-time information is encoded in tiny packets in two dimensions in the same way like the pixels of a TV screen that make a seamless image. If space comes in 2-D bits, then this ‘space-pixel’ would be roughly 10 trillion trillion times smaller than an atom, small enough to fall under quantum mechanics‘ rules. This model opens interesting possibilities for the development of new types of physics. Clearly, the priority is to figure out if this theory is true. 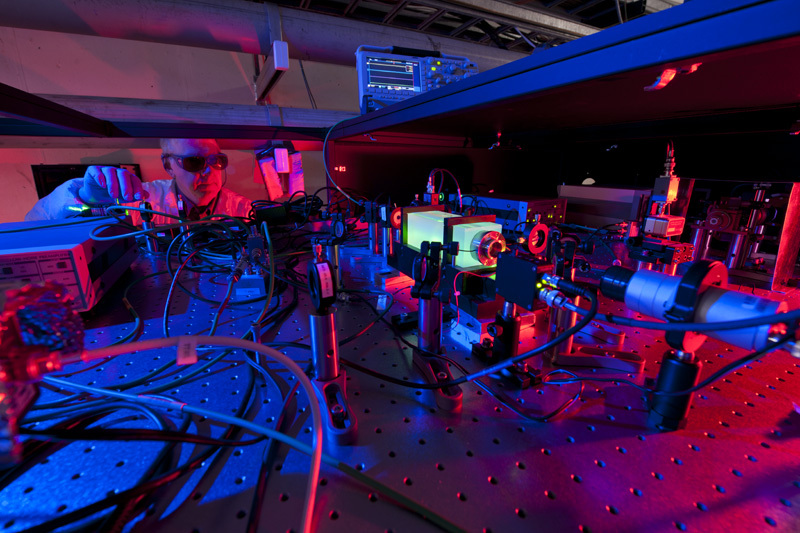 To study the quantum character of space itself, Hogan and colleagues have built a holometer — holographic interferometer — a device consisting of a pair of interferometers placed close to one another. Each one sends a one-kilowatt laser beam (a power equivalent to 200,000 laser pointers) at a beam splitter and down two perpendicular 40-meter arms. The reflected light back to the two beams where the two beams recombine, creating fluctuations in brightness if there is motion. If the researchers’ hypothesis is correct, then “holographic noise” is expected to be present at all frequencies. This “holographic noise” is very difficult to find because it can be influenced by other sources of vibrations. For this reason, holometer will work at very high frequencies – millions of cycles per second – so that motions of normal matter are not likely to cause problems. If we find a noise we can’t get rid of, we might be detecting something fundamental about nature – a noise that is intrinsic to space-time. Said Fermilab physicist Aaron Chou. It’s an exciting moment for physics. A positive result will open a whole new avenue of questioning about how space works. Note: Fermilab is America’s premier national laboratory for particle physics and accelerator research. A U.S. Department of Energy Office of Science laboratory, Fermilab is located near Chicago, Illinois, and operated under contract by the Fermi Research Alliance LLC.